KBS drama ‘SungKyunKwan Scandal’ which aired in South Korea in November last year eventually is causing a frenzy in Japan as well. A popular internet website bulletin board recently posted a picture under title ‘Recent snap from a Japan video rental shop’. The picture shows some shelves of a video rental shop in Japan that are fully packed with ‘SungKyunKwan Scandal’ DVDs and music soundtracks, while promotional posters containing images of the drama’ protagonists Moon Jae-Sin (Yu Ah-In), Lee Seon-jun (Park Yoochun), Kim Yun-hee (Park Min Young), and Gu Yeong-ha (Song Jung-gi) are also attached in front of the shelves. Japan rental shop that is seen in the picture is actually Japan’s largest rental shop TSUTAYA, since last April 20th TSUTAYA has begun to rent out Japanese edition of ‘SungKyunKwan Scandal’ DVD. Meanwhile the DVD sales is expected to start in store on April 22nd. 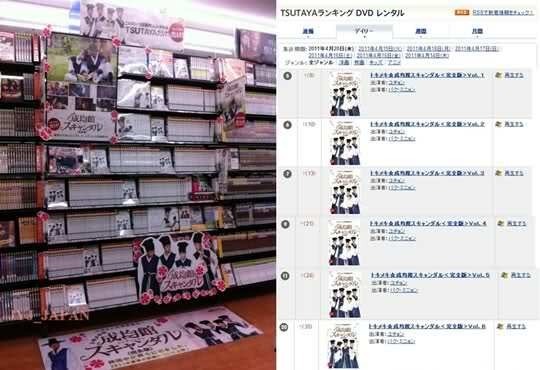 Ever since the Japanese version of ‘SungKyunKwan Scandal’ DVD started to rent out, it ever occupied the 5th, 6th, 7th, 11th, and 20th position in TSUTAYA DVD Rental Chart. “Sungkyunkwan Scandal” is also set to be aired in the Philippines this 2011 under the country’s biggest TV network, ABS-CBN and is also expected to gain major viewership.